Check out CNN's Electoral Map. (CNN) - Some tough news for John McCain in his own backyard, as his home state of Arizona moves from “safe McCain” to “lean McCain” in the latest CNN poll of polls. Freedom will reign in America again! for the change we need in America. Young voters, Please show up at the poll, be patient and wait and then VOTE for Change and your future. OBAMA is your ticket to a better future in America. Polls mean nothing. The actual votes are the only thing that counts. I have heard young voters are not coming out as strong as they should during this early voting period. Alright people. Get of butts and go vote. This election is for your immediate future. You must act NOW. Don't think we'll see much of Joe on the trail, after humiliating the senator that made him a household name. Apparently, McCain forgot about the reliability of plumbers. (Sorry to the good plumbers out there, I've had multiple bad experiences ) The McCain camp can't even keep track of appearances, how are they going to help old man McCain keep track of the issues if he won? HILLARY SUPPORTERS....stand up and vote for :PALIN and MC CAIN...We KNOW you didnt endorse the stealthy OBAMA camp and their continuous line of BS..Get on the Straight Talk Express and y ou will never be sorry and you can stand up on Wednesday and say....WE HAVE SPOKEN. I am just happy for America. If Obama wins, then for sure America is that special place where anyone, no matter what, can be anything he/she wants to be. God bless the US of A.
steve.....so whats your excuse for al gore losing tennesse? i believe that cost him the election, not the hanging chads in florida. also i believe mccain is still ahead in arizona. what are you obama fanatics going to do when the polls turn out to be wrong? 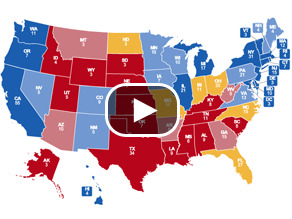 Let's turn the entire map blue. Please vote. If you have already voted, then volunteer to help others get to the polls. We can do this. When the Republican party returns to it's roots of fiscal conservatism and protecting our national resources instead of being a party of false christians and wastrels, I may once again vote with them. Until then, I will vote with the party of true blue Americans. Yes we can and will. Let's hope this trend carried through to election day! Make sure you vote America...and make sure that your vote counts! CNN's estimates have been incessantly conservative and that bodes well for Obama. I cant wait to see the look on the obamabots faces when the realize they have been had, its going to be pricless, they will beg for the bushy years. All blue state send more money then what they get it from Washington. New jersey get 62 cent for each dollar it sends to govt. Alaska get $1.84 for each dollar. Cry about 'Govt. off my back' is always comes from this all red state, maybe they should return the money. How many more republicans like Eagleburger, the Secretary of State under H.W. have to go over and endorse Obama before they get the message! I think that people are getting tired of The Republican Party that has been hi-jacked by the miserable Christian Conservative arm. They are neither christians nor conservative. They have just about bankrupted the United States with their spending. They are also pretty close to being outright fascists or nazis. Wow, I can't wait for Nov 4th. Hmmm ... Lets see now ... In the right-wing extremist hysterical minds, Obama is either a communist, a socialist, a terriorist lover, a threat to national peace, unpatriotic (only they are that), and is willing to lose the war in Iraq. Oddly, McCain has not spelled out how you win an "occupation" (not a war at this point). And, oddly, McCain has neglected to mention that he voted as head of a committee to provide a grant in the amount of $448,000 (and many smaller grants) to the same man he accuses Obama of giving $80,000 to, who is a supporter of the Palestinians. Hmmmm ... small oversight. As I said, a landslide for Obama on Tuesday. Intelligent Americans see through all the crappola drooling out of the mouths of McCain and Palin. Time to unleash the surprise, Johnny . . couple hours it will be Friday night, then the weekend always goes by fast, then just one day . . . Not gonna help ya ta spring it on us wednesday! Or was Joe the Plumber all you got? The only numbers that count are on election day 08! But Obama's latest Palin attack video has struck a nerve with women everywhere!